We’d love your help. Let us know what’s wrong with this preview of Just Think by Nancy J. Nordenson. 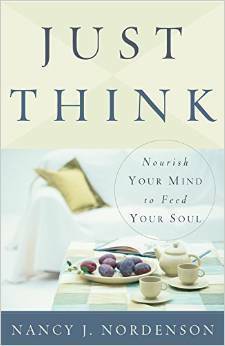 JUST THINK encourages you to expand how you use your mind in and beyond everyday life. Savor each chapter as a catalyst to creativity, insight, faith, vision, and wisdom. Even while the stuff of everyday life demands your focus again and again, you can use the habits and strategies in this book to employ your mind to the fullest and prepare for opportunities ahead. To ask other readers questions about Just Think, please sign up. I'll be honest -- I chose to read this book because it was written by a friend of mine. The title didn't suggest it was aimed at me, a well-educated woman with a lively mind! Neither would the cover have persuaded me to pick up the book. It turns out that the "worst" part of the book is perhaps the title and cover, which don't do the book justice. Between the covers of the book, there is plenty to challenge, enlighten, and enthuse a reader. Nordenson brings herself to the writing, but not in a he I'll be honest -- I chose to read this book because it was written by a friend of mine. The title didn't suggest it was aimed at me, a well-educated woman with a lively mind! Neither would the cover have persuaded me to pick up the book. It turns out that the "worst" part of the book is perhaps the title and cover, which don't do the book justice. Between the covers of the book, there is plenty to challenge, enlighten, and enthuse a reader. Nordenson brings herself to the writing, but not in a heavy-handed way. Rather, her recounting of her experience helps the reader engage the subject. I could see using this book in a church setting with a group of women who want to be thoughtfully engaged in spiritual reflection, but not through typical Bible study. It's so good to read a thoughtful Christian woman! I mean literally. Thought Full. This is a good departure from a lot of the fluffy writing. I enjoyed Nancy's thoughtful questions and am encouraged to continue to Nourish My Mind! And Feed My Soul. What else really matters?